The 10th October episode (Episode #1220) of Monday Night RAW came from Oakland, California as the fallout from Clash of Champions continued. 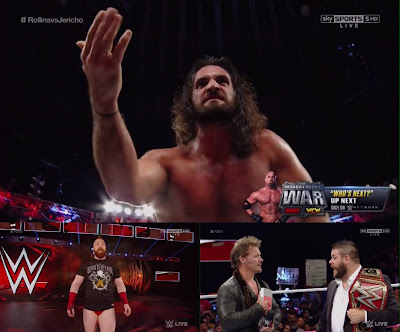 The main event saw Chris Jericho face Seth Rollins for the second time in just over a month, with Jericho having the chance to join a Hell in a Cell match between Rollins and Universal Champion Kevin Owens on 30th October. With Paul Heyman, Cesaro, Universal Champion Kevin Owens, General Manager Mick Foley and Women's Champion Sasha Banks all in major slots on the show, could RAW produce a show that drove them succesfully out of the post-Clash of Champions feel and towards Hell in a Cell? The main event saw Seth Rollins defeat Chris Jericho to keep Y2J out of 30th October's Hell in a Cell match in a very good TV main event. The two wrestled a clever bout, that saw Jericho control the action by focusing in on the ribs that Rollins had injured against Kevin Owens back at Clash of Champions. Indeed, it was Owens turning up on the ramp that gave Jericho the opening in the first place. This was all about furthering Rollins cause as he continues to slowly slip in the babyface role, as his gutsy performance whilst fighting against the pain on numerous moments. Fighting to reach the ropes whilst in the Walls of Jericho and kicking out of a Lionsault, moments after struggling to the top rope for a Frog Splash only to miss. Y2J is one of the best people in the business for making his opponent look good and he worked hard to make sure that Rollins looked a million bucks. There wasn't a lengthy period of dominance for Jericho, meaning most of the match was hope spots for Rollins or Rollins kicking out or surviving offence from Jericho or Rollins selling his injuries. The finish saw a flash of the pair heading into the next gear, with Jericho blocking a Pedigree and going for another and surely match-winning Walls of Jericho only for The Architect to grab a small package and walk out victorious. The events that followed made it clear why Rollins was given a flash win, as opposed to a more convincing Pedigree victory. Rollins quickly turned the table on an Owens attack, with Jericho saving KO from a Pedigree, before KO would bail and leave Y2J alone with Rollins to take a Pedigree. Whilst it was a nice tease for the upcoming Owens v Rollins rematch, but the real story was the seeds being planted for a Jericho v Owens feud. I'd suggest that this was the reason for Jericho not taking the Pedigree in the match. It's good to see some forward planning from WWE and hopefully the work that was put in here will pay off with an incredible Hell in a Cell bout with Owens and Rollins, before Owens transitions in a feud with Jericho, that could end up defining his title run and The Prizefighter right up to WrestleMania season. Slotting into the semi-main slot was Tag Team Champion Kofi Kingston (accompanied by the rest of The New Day (Big E & Xavier Woods) going over Cesaro in a decent match, where the in-ring action was never the focus. After New Day's fun pre-match promo, most of the wrestling flowed nicely with Cesaro and Kingston having a nice chemistry in the ring, that I'd like to see explored more. The story of the bout was that E & Woods had Kingston's back when required, but Sheamus was too busy on Facebook Live to ever help his rival turned tag partner, Cesaro. Of course, this played into the finish, where Sheamus for some reason decided to grab Woods' trombone, Francesca 2, leading to a scrap with E & Woods, before Kingston rolled up Cesaro for the victory. It was entertaining, made sense, but was formulaic and didn't allow the wrestlers to flourish quite as well as it could have. This could be an interesting feud, but I'd like to see get some extra depth over the next two weeks building to Hell in a Cell. Promoted as Mick Foley's Hell in a Cell address and pushed around the idea that Foley had competed in the most iconic version of the contest, Foley was joined by Stephanie McMahon to initial answer Sasha Banks' earlier request (more on that below). The segment would quickly become the Jeri-KO show as Chris Jericho & Universal Champion Kevin Owens headed to the ring as soon as Foley announced that Owens' match with Seth Rollins at Hell in a Cell, would actually be a Hell in a Cell match. Owens and Jericho were their usual uber delightful selves, as Jericho quickly distracted from the fact that Owens didn't want to have a Hell in a Cell match, calling Foley a genie, requesting a private jet and putting Foley on the list twice. I found the ending particular interesting as McMahon appeared to get angry with Jericho, but also gave him an opportunity to get a title match that would also stack the deck against Rollins. The smile on Jericho's face told the story well and whilst I'm not sure how many people will have picked up on it, I'm definitely looking forward to seeing how this unfolds across the rest of the Autumn programme. 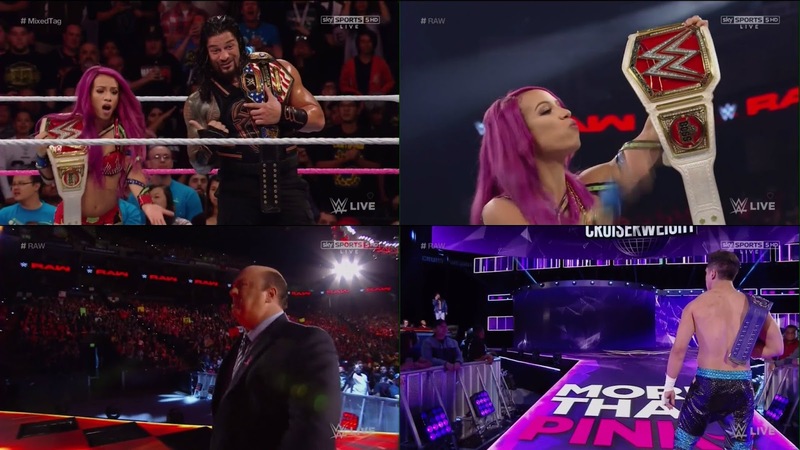 The mid-card was topped by a mixed tag team that saw Charlotte & Rusev (seconded by Lana) put over Women's Champion Sasha Banks & United States Champion Roman Reigns. For me, the best thing about this match was the finish as Banks reserved a roll up from Charlotte, locked on the Banks Statement with Reigns seemingly flying through the air and nailing Rusev with spear to deny The Bulgarian Brute the opportunity to interfere. The spear was perhaps the best that Reigns has ever hit and got a massive pop, partly because of it's visual and partly because of the perfect timing. Outside of that the action was solid, but didn't seem to correspond with some of the stories that had been introduced earlier in the show. For me, Reigns was a little too dominant, especially considering he was winning the match. I would've liked to have seen Rusev look incredible for a long time, build him up to look like he would've defeated Reigns, if Reigns hadn't been able to tag out and you've got an interesting story to go forward with into Hell in a Cell. Rewinding a little, the set-up for the mixed tag came at the top of the show as Sasha Banks opened RAW. Banks opening promo about winning the title and her journey to winning it was very well done. It was written well, felt personal and delivered with conviction. However, things became a bit messy from there as WWE struggled to bring the four competitors together to set up the match. As Charlotte headed out to discuss Hell in a Cell, Rusev interrupted before she'd even made it down the ramp. It quickly became clear that this was another attempt to get Roman Reigns over with the audience. Charlotte & Banks teamed to knock Rusev from the ring, because he called them "Lost women" in a misogynistic rant. There was a wonderful shot of a fuming Rusev dusting himself down outside of the ring and seemingly getting ready to assault The BFFs in some shape or form. Of course, Reigns music hit and he saved the women like a knight in shining arm. Unfortunately, instead of a massive pop, Reigns got a loud boo (mixed reaction, if you're being generous). Not sure how I feel about the message that the companies' top two women couldn't have handled themselves against Rusev. The highlight of the show for me was Paul Heyman's return, as he announced that Brock Lesnar was issuing a challenge to Goldberg for a match at a future date. This was hype heavily throughout the show with Goldberg's ESPN interview with Jonathan Coachman being shown. The simple fact that Heyman made me want to see a rematch from a WrestleMania match that has featured one many a list of the worst matches ever to take place on that show stands as a testament for just how good this man is with a microphone in his hand. Heyman introduced the idea that Lesnar and Goldberg had had similar trajectories, showing a believable frustration that Lesnar lost the original match before passionately building it to a crescendo by challenging The Myth to a bout with The Beast. Just over five minutes of screen time, but every seconding was fascinating to watch. Bravo, Mr. Heyman, bravo. In the top contest from the Cruiserweight division this week, Cruiserweight Champion TJ Perkins continued to steadily get over with the audience as he defeated Ariya Daivari via submission. This was simple and effective contest, that showcased Perkins perfectly as he showed off some of his flashy offence, before Daivari worked effectively as the rough and tumble heel, before some back and forth lead to a strong finish. Daivari was brilliant in his role, generously helping Perkins to look as good as he possibly could, bumping crisply for him when called up, but also allowing him to show his ability to fight from underneath and survive big moves like the hangman's neckbreaker. The finish saw Daivari miss a Frog Splash, appearing to bang his knee in the process, with Perkins hitting a wrecking ball dropkick before locking in a knee bar for the submission victory. Brian Kendrick did as good a job as he could on commentary, despite having to fight against some repetitive questions from Saxton and Cole. The last thing heard was the comparison off Perkins' knee bar and Kendrick's Captain's Hook submissions and that should prove to the story of their 30th October. Lince Dorado & Sin Cara went over Drew Gulak and Tony Nese in a decent Cruiserweight Division bout, that the crowd warmed to well. Show in a Sentence - Mostly entertaining but with some odd or ham-fisted booking, but with a fine TV main event and a wonderful promo from Paul Heyman.